American Sniper was intense from Chris Kyle’s humble beginnings as a want to be cowboy, growing up in Texas, to becoming America’s most deadly sniper and an American legend. The film, directed by an all time great himself, Clint Eastwood, was fantastic. It blended a great mixture of action,drama, and even had bits of humor sprinkled in from time to time. 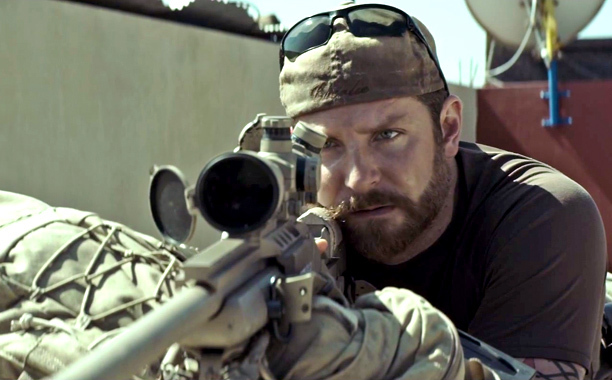 Bradley Cooper did a phenomenal job playing Chris Kyle and deserves all the accolades he is receiving for his role. The film was chilling and offered a realistic look at the horrors of war and the problems our soldiers are faced with upon arriving back home. The film is based on the best selling memoir of the same name by Chris Kyle. I read the book a few years back and loved it. The movie is mostly true to the book only omitting various parts from his young adult life growing up in Texas trying to be a ranch hand and cowboy. Deffinitly check this film out as soon as you can. It’s great. 8/10 worth the watch in theaters. This entry was posted in movie reviews and tagged american sniper, bradley cooper, chris kyle, clint eastwood, geeks, man movies, military movies, movie reviews, nerds, reviews. Bookmark the permalink.